When selling flat, do I need a fire risk assessment? A FRA should indicate the significant finding and an action plan would indicate the urgency of each significant finding. It is necessary that the findings are acted upon as soon as possible and with regards to the completion of the sale, that is between you, the solicitors and the buyer but if I was the buyer I would require the work to be carried out before I exchanged contracts. Thank you for this thread. It has already gone a long way to helping me understand. I'd just like to confirm. We own the downstairs flat of a two storey converted terrace. We are both leaseholders, not freeholders. We're about to sell and have been asked for a fire risk assessment. I understand that only the common area requires this. This is an hallway no more than 1x3m with nothing in it other than a light bulb and carpet on the floor. I understand that we don't need a written document as there are no employees, but even if we were to draw one up, I can't see what we would possibly say? None of the details in the downloadable form you recommended above would apply. What would this document possibly look like? Thank you for your time. As leaseholders you are not owner/landlord or freeholder therefore you are not the Responsible Person (RP) under Regulatory Reform (Fire Safety) Order 2005 and it is the RP who is responsible to conduct the fire risk assessment (FRA). This person, may not need to record the FRA but you could ask them to provide a note indicating that a FRA has been conducted and all is considered satisfactory and see if the solicitor will accept that. It is important to know who has the duty to implement article 8 to 22 which includes conducting a fire risk assessment (FRA). Article 3a states if it is a workplace then the employer is the person designated the Responsible Person (RP) who has a duty to implement article 8 to 22. (ii) the owner, where the person in control of the premises does not have control in connection with the carrying on by that person of a trade, business or other undertaking. Which I interpret as the owner or the persons acting on his behalf, having full control is the RP. It is unlikely this person will employ 5 or more persons therefore he/she does not have to record the FRA but still has to conduct it, which means there is no document to hand on to conveyancing solicitors. On occasions the RP will record the FRA to meet this problem of solicitors requiring FRA, or to use as a reference for future reviews, but legally they may not be required to. I'm struggling too! I'm selling my flat and found out that I need the fire risk assessment and asbestos survey, waiting for freeholder to get quotes although looks like he should've done this when the legislation came in. Do the surveyors have to be part of a recognised professional body? There is no management company so it seems to be a case of when the freeholder can be bothered. In England and Wales the common areas of flats and maisonettes are subject to The Regulatory Reform (Fire Safety) Order 2005 which came in force in 2006 and the order designates the owners/freeholders or a management company, as the Responsible Person or Responsible Persons, who has a duty to conduct the FRA. There is only one FRA per block/building and finishes at the front door of the flats/maisonettes. I cannot help you with the asbestos survey but you could contact the Environmental Department of the local council. Thankyou Tom, I appreciate it! I'm selling my studio flat which forms part of 4 block of flats with communal areas . The buyers solicitor has asked for FRA and Asbestos report. As far as I know it is legal requirement to be provided by the freeholder as I'm just a leaseholder. Do I have to provide or the freeholder and how much does both cost including VAT please ? Your fire assessment would have cost less with Safelincs...... £145. It is the Responsible Person (RP) who has a duty under The Regulatory Reform (Fire Safety) Order 2005 to implement articles 8 to 22 which includes a Fire Risk Assessment in the common areas. This will be the owners/freeholders on the building or the service company acting for the owners, providing they have full control. It is not only the cost of the FRA but any work that has to be done to meet the action plan which forms part of the FRA. Depending on circumstances, the FRA may not need to be recorded and there will be no paperwork to give to the solicitor. I do not know the cost of a FRA but it would depend on the amount of work that has to be done and this should have been done eleven years ago. An asbestos report has nothing to do with fire safety you need to research this separately. I've read all your Q&A's. I am selling 2 flats in a conversion that was done in the early 90's and complied with all regulations then. I own the freehold and will be granting leases and then transferring the freehold to the new owners. I need a Fire Risk Assessment Report and will comply. The communal hallway which gives access to both flats, at ground level, is 0.97m x 3.39m. The fire doors to both flats open outward into the communal hallway. Do you know if this increases or decreases risk? Does such a communal hallway need fire and smoke alarms? A fire extinguisher? Doors opening outwards from a room is very unusual, they normally open inwards, and they would also create an obstruction which makes me surprised the building control office accepted them. Without personal knowledge of the situation I cannot be definitive but I would think it is unacceptable because of the obstruction problem. The guidance for premises like yours is FIRE SAFETY Guidance on fire safety provisions for certain types of existing housing and all you need to know you will find in there. Please can someone help? I am part of a flat mgt company - we own the leasehold for the four flats, so the flat owners are the mgt company for the building. A seller has had to provide a fire safety certificate for common areas, which has been provided to the mgt company by his solicitor with "requirements" - are we legally obliged to implement? There is no such a thing as a fire safety certificate, it is more likely to be fire risk assessment (FRA). The common areas of flats are subject to the The Regulatory Reform (Fire Safety) Order 2005 and it defines a Responsible Person (RP), which in your case would be the management company which are required to conduct a FRA. A occupant has no legal powers with regards to a FRA and it is the RP (management company) who has to conduct A FRA, considering the significant findings. The occupant could report their finding to the Fire and Rescue Service who may conduct an audit of your premises and you would need to act on any concerns of theirs. I am also selling my flat and the buyer solicitor is demanding a fire assessment. There are 6 flats in our building and we have a resident association company which owns the freehold and we have a share of the freehold. We are also directors of the company. I want to understand if we legally need to carry out an assessment? From reading previous threads, it sounds like we only need to do a self assessment? You are subject to The Regulatory Reform (Fire Safety) Order 2005 which requires the Responsible Person (RP), as designated by the regulations, to conduct a fire risk assessment (FRA), and has been the situation for the last 12 years. In your case the the RP is the resident association company therefore all of you share the role of RP, as directors. Yes you can conduct the FRA yourselves if you consider yourself competent to do so and I am assuming you are purpose built flats therefore the guidance would be Fire safety in purpose-built blocks of flats. Again assuming you do not employ anybody you do not require to record the significant findings but it is best to, as it makes it much easier when dealing with solicitors and others. Check out https://www.firesafe.org.uk/fire-risk-assessment/ it may be of help. 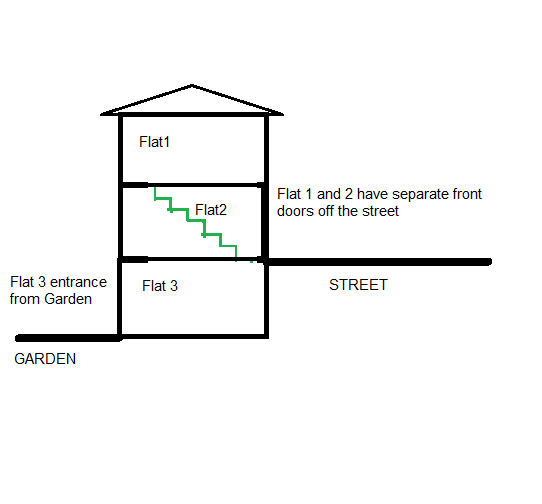 I have a building with 3 flats, each with separate entrances off ground level as my sketch attached. Each flat is 2 bedrooms and is 12metres deep. Is a FRA required in this case? I would appreciate all assistance and thanks in advance. No - no common areas, the Fire Safety Order does not apply. Thanks Anthony B your assistance is much appreciated. I am selling a freehold to a victorian house conversion of two flats to the two leaseholders. The downstairs is accessed by a front door and the rear flat is access by its own front door via a staircase. Does this require a fire risk assessment? No internal communal space by the sounds of it so no.